An investigation has begun after a garden centre in South Gloucestershire was allegedly allowed to kill nesting robins considered "a pest". Wyevale garden centre in Milbury Heath near Thornbury reportedly destroyed two chicks, an adult and the nest. It was given permission and a licence for the killing by the Department of Food and Rural Affairs (Defra). But the RSPCA has raised concerns and the government department is now looking again at the action. RSPCA Inspector Glyn Roberts said he was called to the centre after being tipped off. He was told by the centre's manager that the birds had been flying in and out of the cafeteria via air vents and were considered a health hazard. He said the manager added that he had been called out in the night as the birds were triggering burglar alarm sensors. 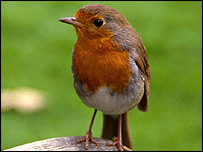 RSPB spokesman Grahame Madge said: "The question that really needs to be asked is, was it necessary to cull the birds?" A Defra spokesman said the application was considered by an experienced wildlife management adviser. The killing of robins is only permitted where there is considered to be a genuine threat to public health or safety and where all other practical alternatives have been tried and failed or are considered ineffective. The RSPB said the bird, of which there are an estimated 8.4m in the UK, was not under any threat. The garden centre manager said he could not comment and the national chain, of which the centre is a part, was unavailable for comment.